Date of Exodus. What am I missing? Yada Yahweh Forum » Research » Archaeology and Scripture » Date of Exodus. What am I missing? Perhaps I can't see the forest for the forest,(hence, "What am I missing"?). Or my math is skewed. The Exodus liberation occured on Passover 1447 bce? The Yahudym were enslaved for 400 years, beginning 1847 bce, and lived in peace for 30 years,(1877 bce), and there were 7 years of feast and 7 of famine (1891 bce) and keep in mind this does'nt even include the time Yowceph was in prison nor the time he was enslaved. This appears to be in conflict with the 1693 bce high water mudlines said to indicate the Nile floods that caused the years of scarcity. From my own research I agree with your rough biblical date for exodus of ca 1400s bc rather than the orthodox 1200s bc; and 400 yrs (as opposed to 215 years) in Egypt; and date for Joseph of ca 1800s bc rather than orthodox 1700s bc. I assume that your high water lines is refering to the 12th dynasty high nile of Rohl etc, though the usual date is 1800s not 1600s? The orthodox Egyptian dynasties dating is wrong though. 12th dyn is too late in Egyptian history for Joseph who was earlier in Biblical history (when we put whole timelines side by side). Moses "1200s" "19th dyn" is also too late. Herodotus said Moeris (12th dyn) was only 900 years before [Amasis 2]. Herodotus said Menes was (1)1340 years before Seti (19th) dyn; Josephus said Menes was 1300 years before Shishak (900s bc); this means Menes not more than 2300s bc, and 19th dyn ca 900s bc. So one can not match "dates", one has to instead find synchronisms and sequences. There are quite a lot of famines/droughts in Egyptian history (and quite a few in biblical too). Scanning all Egyptian history only one time only-best matches for Joseph and for Moses. Joseph was in the 3rd-4th dynasty (Joseph/Zaphenath is either Sekhemhet, or "Imhotep", or Sphinx, or Djedef-re). Goshen seemingly matches Giza/Gizeh/Er-ges-her "beside the high" (roughly modern Cairo) [or else matches Sokhem (Latopolis where Josephus said exodus started from)]. Potiphera "preist of On" (and/or Potiphar captain of guard) may be "Ra-hotep" priest of Heliopolis (and/or leader of warriors of monarch). Jacob may be Khufu (their sons seemingly may match). 7 years famine in Djoser's/Zoser's reign (Sahel & Philae inscriptions); famine scenes of Unas beside Sekhemhet's complex; models of granaries in Old Kingdom tombs; Bent Pyramid might represent 7yrs plenty & 7yrs famine? 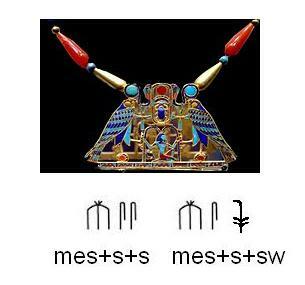 Moses/Moshe was in the 2nd half of the 12th dynasty (he himself may be either the blue figure on pectoral of Sit-hathor-yunet with glyph M-s, or "Moeris", or Amenemhet 4, or the rebel Mesh remembered later in the Amarna letters)..
Herodotus said the chariots/horses lost in reign of Sesostris (12th or 19th dyn). Brick buildngs most common in (FIP &) Mid Kdm/12thdyn. Hebrew slaves may be on pectoral of Mereret. San tablet of 400 years has 400yrs from Hyksos king to 19th dyn king roughly matching 480 yrs Moses to Solomon. Shishak was in 19th dynasty for various reasons including one mentioned above. signature: Water fluoridation ("kool-aid", wormwood) wrecks disadvantaged peoples (like me) lives/health/ability. I thought the Exodus was 1468 BCE, year 2500 of Yah. Interesting possible confirmation is that exodus 2666 am in jewish, and Flood in 1656 am + 10 x 1 = 1666 am, both recall 666? 1000 yrs is about right (c 300-400 yrs + 215 yrs + 430 yrs). I agree with 1400s bc. Its the Egyptian dating/dates that is out. The biblical and orthodox Egyptian not seeming to match means that either orthodox Egyptian too long/unreliable, or biblical "too short/unreliable". When things don't match the world say the biblical/traditional must be wrong instead of seeing that their modern theoretical reconstruction is wrong. I misquoted the flood calibrations as mentioned in the Selah chapter of YY. According to Rohl the calibrations indicate the year 1663 bce. Rohl also maintains that Yowceph arrived in Egypt in 1693 bce. This can't be if the Hebrew folks were enslaved for 400 years and then liberated in 1447 bce.